In 2002, New Mexico became the first state to place Indian law on the state bar exam. This decision made basic knowledge of Indian law part of the competency expected of all licensed attorneys. This result arose from the University of New Mexico School of Law's (UNM) significant role as the only law school in the state. In combination with the social and political history of the state these elements produced this historic result. 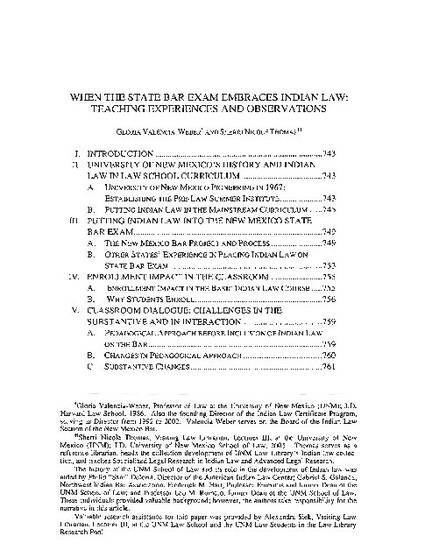 This paper outlines the history of Indian law at UNM and discusses the formal process that placed Indian law on the state's bar exam. The discussion concludes with the immediate impact of this bar exam inclusion on the teaching of Indian law and the insights gained from the classroom experience. The perspectives offered herein are from the professor and a research librarian who was the tutor for the first course after the addition to the bar exam. Originally published in the North Dakota Law Review.